Imagine having someone standing on every street corner in the world, spinning signs with your store’s name on them and directing traffic to you. That’s what Search Engine Optimization (SEO) does for your eCommerce site. SEO plays an enormous role in where all websites rank in search results, including eCommerce sites. If you want to rank higher and make it easier for people to find your products in search engines, then you need to optimize your site. Getting your products ranked high in search engine results helps you to reach more people and make more sales. Search engine optimization involves developing strong focus keywords that are used throughout your eCommerce site. These focus keywords should be included where they naturally and logically fit. Focus keywords can easily be worked into things like meta descriptions, product pages, URLs, permalinks, image names, and alt text, in addition to the rest of your site’s content. But remember, only use them naturally. In this article, we’re going to take a deep dive into the WooCommerce platform and get you on your way to ranking #1. We’ll talk about how to optimize WooCommerce SEO with 10 super useful tips and discuss our picks for the best SEO plugins and themes. WooCommerce, when combined with WordPress, creates an easy-to-use, customizable eCommerce platform. Common eCommerce features like payment and shipping are simple and most features are included with the plugin. There are also a ton of useful WooCommerce plugins and tools that can help you boost your online store’s revenue. Shopify is a comprehensive eCommerce platform. It’s designed to be beginner-friendly, so there’s a limit to the customizations you can do. To be clear, both Shopify and WooCommerce include everything you’ll need to sell your products online. WooCommerce just offers up a lot more customization for those who are looking for that kind of freedom. WooCommerce is also quite a bit cheaper. 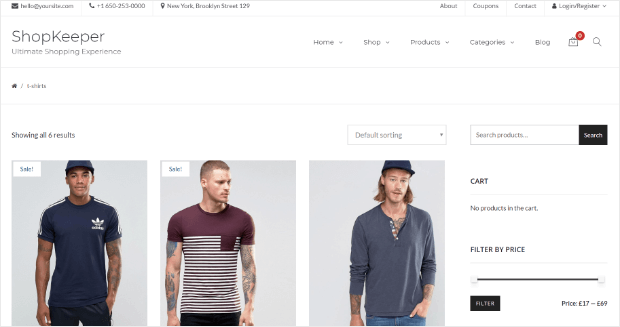 The WooCommerce plugin itself is open source and freely available on WordPress, while Shopify plans start at $29/month. Of course, there’s a lot that goes into opening an online store that isn’t free; domain name, SSL certificate, and WordPress hosting all cost money. But, not having an ongoing monthly fee definitely sets WooCommerce apart. SEO functionality is an area where WooCommerce and Shopify really differ. Shopify comes with an SEO-ready site structure. This means that it is built to help users get their stores near the top of search results. It automatically generates a sitemap and allows you to customize meta descriptions, title tags, and URLs. You can also set file names and alt text for images. You can see our complete Shopify SEO guide for more details. What about WooCommerce? Is WooCommerce SEO friendly? Short answer: yes, WooCommerce is SEO friendly. The longer answer is that WooCommerce is built using code optimized for SEO but doesn’t actually have much in the way of SEO features. Where WooCommerce really shines is in its integration with WordPress and all of the plugins and extensions that are available. With plugins like Yoast SEO, which we’ll talk about more later, WooCommerce and WordPress can give you an even bigger SEO boost than Shopify’s SEO features. You just have to be willing to put more work into customization. We’ve hinted about all of the customizations that are possible with WooCommerce, but not a lot about how to SEO WooCommerce. Let’s fix that. Here are 10 WooCommerce SEO tips to get you climbing in those search results. Product descriptions are typically not long, but they should be treated as bite-sized bits of content. This means taking the time to make sure they’re well-crafted and search engine friendly. 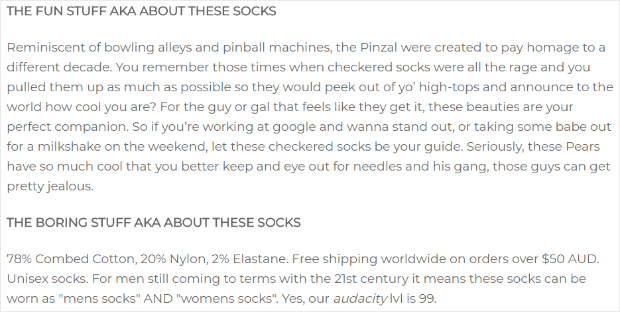 Check out this product description for a pair of socks from Odd Pears. They use keywords throughout, but the description itself is engaging and funny content. Search engines use product descriptions just like any other content on your site. They contain vital information about your product page and what keywords to rank it for. You can use manufacturer product descriptions, but your ranking in search results will be better if you write your own. When search engines have to decide which block of the same content is the original, they aren’t always accurate. Best to just write your own product descriptions as you would the rest of your site’s content. Page titles should be descriptive enough to tell both searchers and search engines what your page is about. 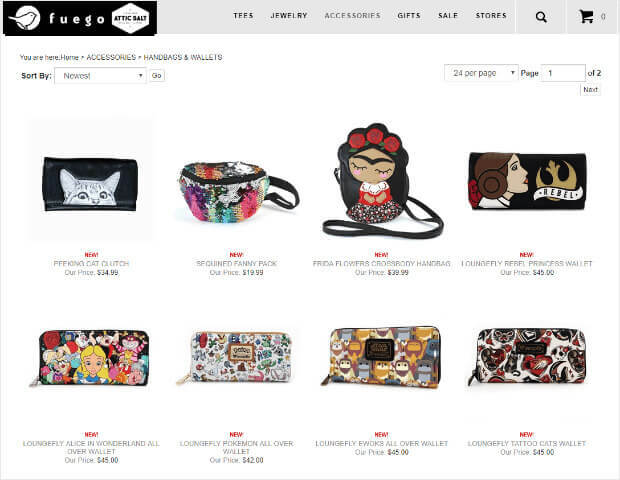 For most eCommerce sites, you’ll have category pages and product pages. Category pages not only help shoppers find the products they’re looking for, but they prevent individual product pages from competing with one another in search engine results. You can optimize category pages to rank for a broad term and use product pages to rank for specific terms. 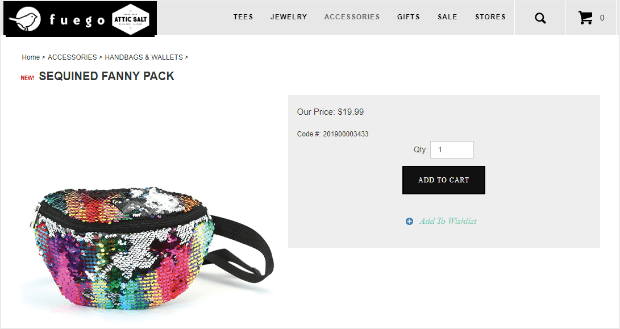 For example, a category could be “Handbags and Wallets,” with product pages indicating the specific model of bag (“Sequined Fanny Pack”). The page title and SEO title are the same a lot of the time. You can tweak your SEO title for a better search ranking with a tool like Yoast SEO. You should be using keywords in your page title and SEO title, but remember that content is for people first. Don’t throw readability out the window to squeeze in more keywords. This will definitely hurt your site and your business in the long run. Breadcrumb links appear along the top of product pages and help visitors move back to previous category or landing pages easily. They show visitors where they are and where they’ve been. Breadcrumbs are not only helpful for visitors but are also used by Google to determine how your site is structured and appear in search results. WooCommerce includes breadcrumbs that are useful as they are, but to get the most out of the SEO capabilities of breadcrumbs you can use a plugin like Yoast SEO. We’ll talk more about the Yoast SEO plugin in our best SEO plugins section below. We’ve already talked about breadcrumbs, but there are other ways to ensure that visitors don’t get lost and frustrated on your eCommerce site. You can improve your site’s navigation by keeping your main navigation easy to follow. Google will crawl every page on your site, but visitors definitely won’t. Your main navigation should only include links to the most important pages for your site’s users. Other links can go in your site’s footer. Since Google uses search spiders to automatically review and index search results, if a page in your site isn’t linked somewhere Google can’t find it. A perfect solution to this problem is adding links to your site footer. This tells Google what pages are important since you’re linking to them in every page’s footer. Plus, your visitors will be able to get to all the important parts of your site without an overly complicated main navigation menu. For those of you using WooCommerce and WordPress, go ahead and enable WordPress permalinks to make sure your URLs are accessible to visitors and search engines alike. To do this, go to Settings » Permalinks and choose a URL structure. 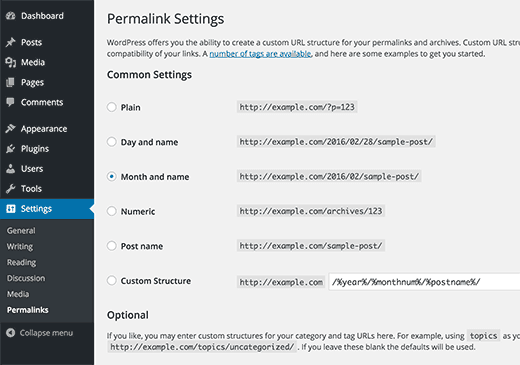 Permalinks allow you to use keywords in your URLs instead of product IDs. It may seem like a small thing, but it makes a big difference in how well visitors can get around your site. Meta descriptions don’t actually help your SEO directly, but they can go a long way to improve your clickthrough rates. They show up under the title of a search results entry and describe the content. Meta descriptions give you another way to entice searchers to click. Google sometimes uses meta descriptions from a page to generate a search results snippet. Because of this, Google recommends that each page of your site have its own unique meta description. You can edit meta descriptions using the Yoast plugin. There is no fixed length for meta descriptions; Google says that the snippets housing the meta descriptions are generated dynamically by their systems. Having said that, the average length for the snippets shown in recent desktop search results is around 160 characters. You don’t need to rush to change all of your meta descriptions. Remember that snippets are generated dynamically, so it’s not a guarantee that your meta descriptions will even make it into search results. Going forward, however, consider it best practice to optimize your meta descriptions and make them unique to each page. The more useful these descriptions are, the more likely they are to appear in search results. Take a look at the difference between these search results. The first uses text from the post in the results. The second uses the meta description. Which would you click? Neither snippet is terrible, but the second snippet includes an up-to-date meta description touting both a sale and free shipping. We’d definitely click the second one. Adding alt text to images is helpful in a couple of ways. For starters, it makes your site accessible to people who rely on page readers to browse. Second, alt text can give you an SEO boost. Alt text is what shows up if your image doesn’t for some reason. You should use clear and concise alt text that provides a good description of the image. Alt text is a great place for keywords, but don’t forget that keywords need to always make sense and flow naturally. Duplicate content is a tricky little beast. If you have pages on your site that are very similar to other content on the web, Google might remove your content from their rankings. The easiest way to make sure that your content will be ranked high is to write and publish original content. But, what can you do about content that already exists? First, you need to find out if you duplicate content. You can look for the content manually (not recommended if you have a lot of content), or use an OptinMonster recommended tool like SEMrush. If you have two or more URLs containing identical content keep the page that has the most internal links, ranks the best, and has had the most organic traffic. Then, redirect the other pages to the page you’re keeping. WordPress has several plugins to help with creating redirects. Yoast’s premium version also has this functionality. Redirects become vitally important if you are moving from one eCommerce platform to another. Going from Shopify to WooCommerce (or the other way around) will likely result in changes to URL structures. If you want to keep your page rankings from the Shopify URLs you’ll need to redirect those to the new WooCommerce URLs instead of just replacing them. Both redirects and canonical links will work for duplicates across multiple domains that you own. WooCommerce comes with thousands of extensions and plugins you can use to grow your business. With so many plugins available, it can be overwhelming to find the best ones to help you with the SEO for your WooCommerce site. Lucky for you, we enjoy doing this sort of thing. Here are OptinMonster’s picks of the best SEO plugins for WooCommerce. Yoast SEO is one of the best SEO plugins out there. We use it on all of our sites and it’s one we always recommend. With Yoast SEO you can choose a focus keyword for every page of your site. Once you’ve selected the focus keyword, Yoast SEO gives you suggestions on how to best use it on the page to get great results. Using the right keywords is important to attract the right visitors and convert leads to customers. Yoast SEO will help you use the right keywords effectively. Want to learn how to use Yoast SEO on your site? Yes, 404 errors can be fun sometimes. No, they shouldn’t be a regular occurrence. The Broken Link Checker plugin can help you find broken links so you don’t end up with a high bounce rate from rampant 404 error pages. This plugin is a bit too resource intensive to leave installed and active all the time, so we recommend installing it and activating it when you’re going to use it. Going through your site twice a year will keep things updated. 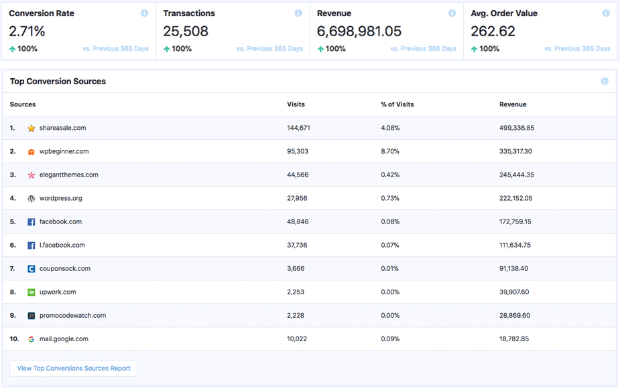 If you use Google Analytics to track data like site visitors and top keywords, you will love the MonsterInsights plugin. MonsterInsights gives you the power of Google Analytics right from your WordPress admin area. You can monitor traffic spikes and potential problems in real time to maximize potential revenue for each customer. WordPress is the most search engine friendly website builder in the world. To take full advantage of the existing SEO functionality in WordPress make sure your WooCommerce site uses a theme built for SEO. Here are a few of the best SEO themes for WooCommerce. As the name suggests, Academy Pro caters to websites selling online courses. This theme is eCommerce ready and includes full support for WooCommerce. It features easy setup, custom widgets, and customizable theme options. Corner is clean, minimalist, and bright. The theme includes widgets for Twitter, Flickr, and content discovery. It’s also powerful enough to be extended with a page builder plugin and plays nice with WooCommerce. Creativo is super customizable. It includes 7 skins, 3 design layouts, and multiple header styles. 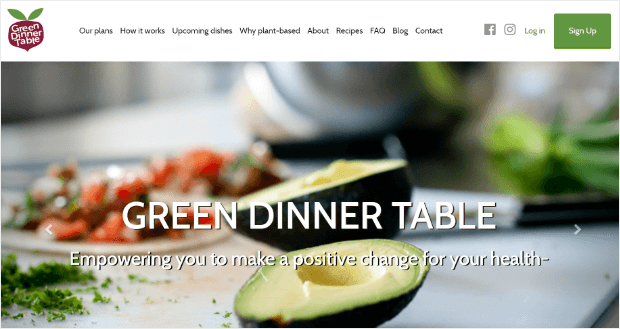 This theme is WooCommerce ready and includes a ton of goodies to extend theme features: slider, live chat plugin, portfolio and testimonial sections, sidebars, custom widgets, and social media integration. And then some. Looking for more? Check out these themes. There you have it. A comprehensive guide to SEO for WooCommerce that will help you level up in 2019. 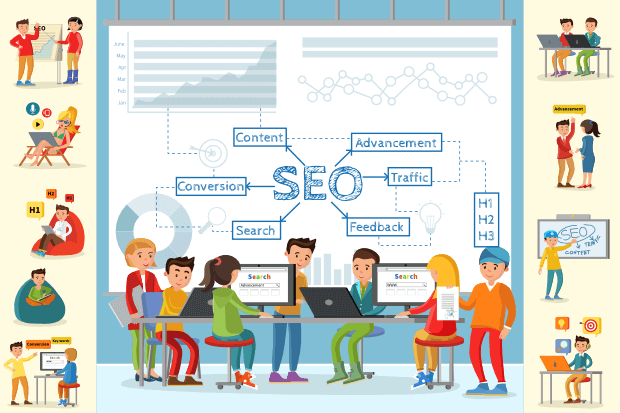 Check out this post for more SEO tips. Follow us on Facebook and Twitter for more ways to boost revenue and stand out online with OptinMonster. Hey, great post. I’m a massive advocate for Yoast SEO so good to see it included!